The Marquee ActiveX Software is a flexible programmers tool for adding LED Marquee communication to your applications. Create display templates with variables, program alarm messages and manage TCP/IP and serial communications all in one powerful control. The Marquee ActiveX Control comes complete with everything you need to trigger messages, alarms and display real-time information. Install, configure and use the marquee driver in only minutes. The Marquee ActiveX Control will communicate with any of the indoor LED electronic signs via LAN (TCP/IP) or Serial connection via PC COMM Port or USB port. ► Display real-time production stats. ► Broadcast event and alarm conditions. ► Control text attributes such as color, font and flashing. ► Schedule messages to display at different times, locations, and days. ► Directly display your existing database messages. ► Saves weeks of Marquee specific software development time. ► WYSIWYG Marquee screen template editor. ► Place variables anywhere on the screen template. ► Display multiple screen templates in sequence. ► User definable alarm messages will override screen templates. ► Alarms will queue and display in sequence. ► Provides true display emulation so applications can be tested before the Marquee is installed. ► Built-in management of TCP/IP and Com port connections. 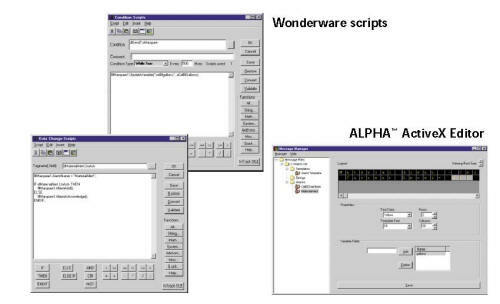 ► HMI Manufacturing Software such as Rockwell RS View, GE Cimplicity, Wonderware, and Intellution. ► Business Applications such as Microsoft Excel. ► Development Environments such as Visual Basic and Visual C++. ► Alarms will queue in sequence.